Jerry Falwell Jr. Has The Virginia Sadz - Joe.My.God. 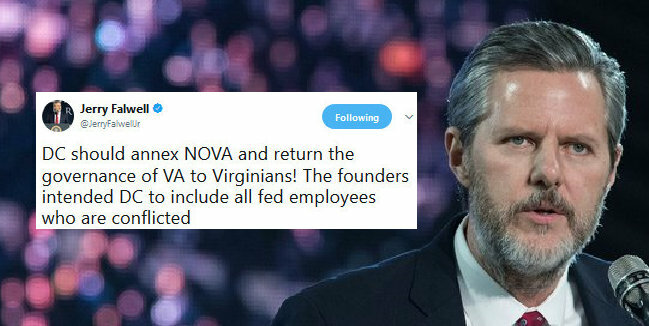 Jerry Falwell Jr., the president of Liberty University and an ally of President Trump, said on Tuesday that the District of Columbia should “annex” Northern Virginia and return governance of the state “to Virginians. His argument appeared to hinge on federal employees who work in Washington while living in Virginia. Parts of Northern Virginia, including Fairfax County and Alexandria County, were won by Northam in Tuesday’s election.